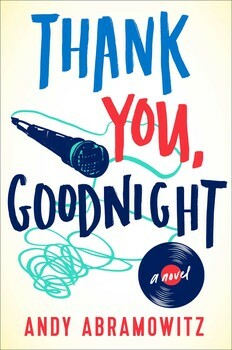 Summary: In Thank You, Goodnight, hailed by Billboard as “High Fidelity and About a Boy with a dose of Music & Lyrics thrown in,” the lead singer of a one-hit wonder 90s band tries for one more swing at the fence. Teddy Tremble is nearing forty and has settled into a comfortable groove, working at a stuffy law firm and living in a downtown apartment with a woman he thinks he might love. Sure, his days aren’t as exciting as the time he spent as the lead singer of Tremble, the rock band known for its mega-hit “It Feels Like a Lie,” but that life has long since passed its sell-by date. But when Teddy gets a cryptic call from an old friend, he’s catapulted into contemplating the unthinkable: reuniting Tremble for one last shot at rewriting history. Never mind that the band members haven’t spoken in ten years, that they left the music scene in a blazing cloud of indifference, and that the only fans who seem to miss them reside in an obscure little town in Switzerland. Every so often, I like to read books with men as the main characters. It doesn't happen all that often, but there are a few authors like Tropper, Hornby, etc. whose books I really appreciate. They have intriguing characters along with humor and sensitivity, and they also seem to have some wonderful insights into life. THANK YOU, GOODNIGHT by Andy Abramowitz is in the same vein as these books, and I definitely liked it. THANK YOU, GOODNIGHT tells the story of Teddy Tremble, an almost middle-aged attorney who was once the lead singer of Tremble, a rock band that had a huge hit and even won an Oscar. He is comfortable in his career and relationship; however, a part of him still misses the rock star lifestyle. When he discovers that a photographer has included him in a collection titled, "It Feels Like a Lie... and It Looks Like a Mess" that is on display at the Tate Modern in London, his pride is seriously hurt. In what is beginning to look a little like a mid-life crisis, Teddy decides to confront the photographer in Sweden. He is surprised to discover that his band Tremble is still quite popular in this small Swedish town. Teddy decides to relaunch the band, but first he has to get the other band members to agree... and that might not be easy! The members haven't spoken for almost ten years and there is some baggage between Teddy and the female member. I thought THANK YOU, GOODNIGHT was a very fun read. Teddy was a fantastic character, as were his bandmates; and I enjoyed following Teddy on his path to bringing back the band. The book was both hilarious and touching, and it even made me think about getting older and a few other life-defining moments. Overall, it was a pretty good read! Teddy was just great. The story was told in his voice and I think Mr. Abramowitz captured his essence perfectly. Like Teddy, Mr. Abramowitz is a lawyer who once played in a band so his experiences definitely gave the story a bit of authenticity. In so many ways, this book was a coming-of-age story for Teddy; and I loved seeing him get a second chance at "proving" himself. It was interesting to see both Teddy's angst at the unflattering photograph as well as his desire to bring the band back together for one final hurrah. Another thing I really liked about THANK YOU, GOODNIGHT was the balance humor and seriousness in the story. Make no doubt about it, THANK YOU, GOODNIGHT is hilarious. The scene when Teddy finds the photograph and then his entire trip to Sweden are crazy funny. And the scenes when he meets up with the band members, one in particular, are worthy of a few laughs as well. In fact, so many of the scenes read like a movie... if that makes sense! However, this novel also was touching. Teddy's journey does have some sad moments and regrets that he hasn't been able to get over. I adored Teddy and my heart broke for him. I actually was rooting for him and Tremble to have a second chance at success. I wanted Teddy to experience a sense of fulfillment that he obviously thought was missing from his life. THANK YOU, GOODNIGHT would make a great book club selection... especially if your group includes some men. There is a reading guide available with twelve questions along with some ways to enhance your book club meeting. Some of the themes you might want to explore include regret, guilt, self-doubt, secrets, friendship, love, communication, and second chances. I enjoyed THANK YOU, GOODNIGHT for so many reasons. It was an enjoyable read that also make me think -- and that makes a book pretty special in my mind. I'll have to read this soon - I could use some humor in my life. This one keeps popping up in my feed, I'm glad to see you liked it. I love the cover! I'll have to check it out!